On March 12, 2008 Archbishop Burke excommunicated Rose Marie Hudson and Elsie McGrath. The decree was delivered by a courier at their respective homes. Rose Marie and Elsie were ordained priests in a Jewish Synagogue in St. Louis. 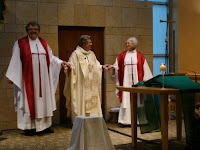 (CRC: Central Reform Congregation) Rabbi Susan Talve and her congregation hosted the ordinations as an act of hospitality reflecting the tradition of Abraham and Sarah in the Hebrew scripure. Over 600 people attended including people from Jewish and other Christian churches. Roman Catholic Womenpriests reject the penalties of excommunication, interdict, and any other punitive actions by church officials against Roman Catholic Womenpriests. Roman Catholic Womenpriests are loyal members of the church who stand in the prophetic tradition of holy disobedience to an unjust law that discriminates against women. The Catholic Church teaches that a teaching or law of the church is authoritative only if it is “received” by the sensus fidelium, the community of faith. If the community of faith does not accept the law, it has no effect on us. All people have a moral obligation to disobey an unjust law. St. Augustine taught that an unjust law is no law at all. Since 70% of U.S. Catholics favor women’s ordination and a growing majority of Catholics worldwide also favors women’s ordination, we do not “receive” or accept the Church's prohibition against the ordination of women and the church’s continued reliance on sexist metaphors, beliefs and assumptions for denying ordination to women. Recent scholarship affirms that women were ordained in the first twelve hundred years of the church’s history. The first half of the church’s history provides us with images and accounts of the inclusion of women in Holy Orders that contradict the later prohibition. The evidence provides a tradition we reclaim.